The “Wayne Estate” houses built in the late ’80’s and early ’90’s by Wendell and Treat have always seemed to your columnist to form the never changing architectural background of Wayne and St. Davids. Many other houses, exemplifying more modern styles of building, appear in various parts of our two suburbs, some set in the midst of a block of those Wayne Estate houses, others built in sections of the township as yet undeveloped in the late 1900’s. At present the popular ranch type house in all of its variations seems to dot the landscape in every direction on every road on which one may drive. The Wayne Estate houses are certainly not beautiful – yet withall they have a dignity all their own, and certainly they have been substantially built. To this fact, anyone who has ever sought to make either exterior or interior alterations can testify – and there are few of these houses that have not been changed in one way or another in the 60 years or more since they were built. Yet “once a Wayne Estate house, always a Wayne Estate House”. There is no camouflaging their architectural style. With all the structural changes that have taken place in most of these houses, there is even more change in the mode of furnishings. For the first time since your columnist has become interested in these houses, she has found some excellent photographs of interiors as shown in the three illustrations with today’s column. Like several other recent pictures, they are from the collection of George W. Schultz, who came to Wayne with his mother and father as a young man in 1888. 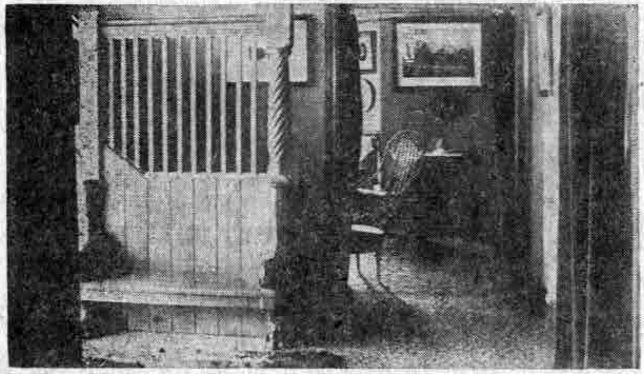 The first picture shows the hallway of the Schultz home, in the 200 block on Walnut avenue; the second the drawing room and the third the dining room. This was the Victorian era of furnishing, more formal and more ornate than any that has followed it. As the Schultz family had lived in Philadelphia, on West Franklin Square, before moving to the new suburb of Wayne, much of their furnishings perhaps came from “the town house”. At any rate these furnishings are probably typical of a really comfortable home that was “modern” in the middle eighties. To some few these pictures will bring back some nostalgic memories of a childhood spent in just such comfortable and home-like surroundings. To others they will represent in general the home background of parents or even of grandparents, a background the present younger generation only knows through the eyes of an older generation. To that younger generation a “drawing room” is practically an unknown quantity! But to all alike these pictures of one of the first Wayne Estate houses to be purchased and occupied will be of more than passing interest. 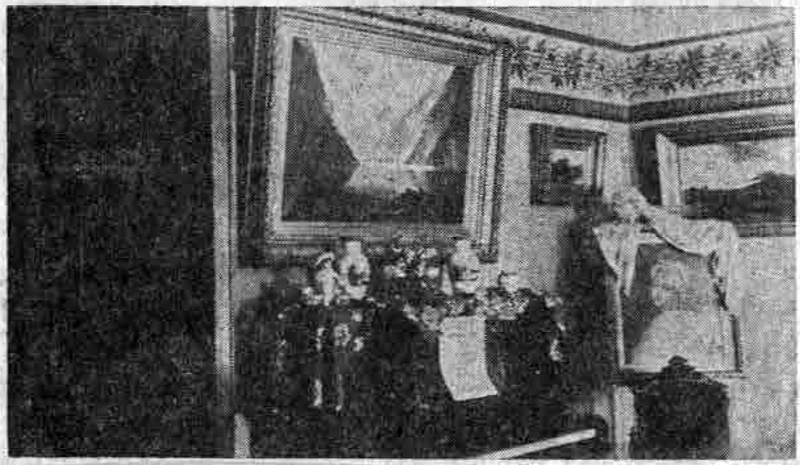 Illustrations for this week’s column have been made from two more of the pictures in the book of priceless old photographs of early Wayne, lent to your columnist by George W. Schultz, of the Anthony Wayne Apartments. An amateur photographer of outstanding ability, Mr. Schultz made a pictorial record of Wayne, as it looked in 1891, which has been carefully preserved. 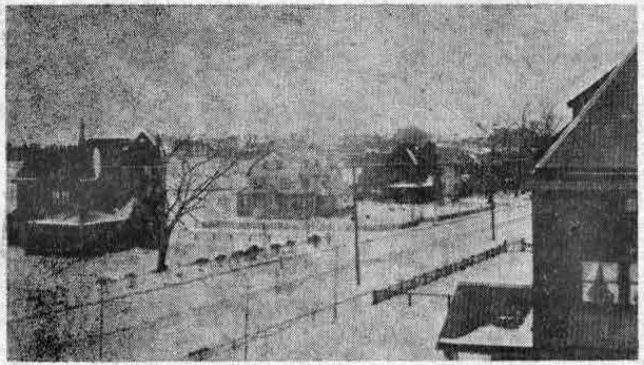 The first picture shown today was taken from a third floor window in the Schultz house, now numbered 211 Walnut avenue and occupied by the Frank H. Moore, Jr., family. The view is toward the west and shows many of the 26 houses which, at that time, made up all of North Wayne. The house immediately next door is now numbered 207, and is occupied by Dr. and Mrs. John J. Berg and their children. Back in the ‘eighties it was the property of the Boyd family. To the right of the old Schultz house is the present home of Miss Mary DeHaven Bright, originally occupied by the Henry Baring Powel family, whose young sons were close friends of George Schultz and his brother William, in the early days. The original of this picture, when examined under a reading glass, brings some interesting old landmarks into view. One is the cupola on the old Bellevue Hotel, the famous summer hostelry destroyed by fire during a raging blizzard on the night of March 15, 1900, nine years after this picture was taken. Several among Wayne’s old timers still recollect the sight of this burning cupola, as it rolled over and over down the snow encrusted hill to the Pike. Another landmark in the dim background of Mr Schultz’s picture is the very handsome Radnor Cricket Club, then located near the railroad, on the property now used as a playfield by the Radnor Township Schools. That building, too, was destroyed by fire. Still another landmark is the steeple of the present chapel of the Wayne Presbyterian Church, presented to the Charter members in 1870 as a gift from one of Wayne’s pioneer citizens, J. Henry Askin. In the more immediate background of the picture are scattered houses on the south side of Walnut avenue. The backs of other houses on Beechtree lane are also plainly discernible. Looking to the south, there were then no homes between Walnut avenue and the railroad, as those now on Poplar avenue are of a considerably later date. 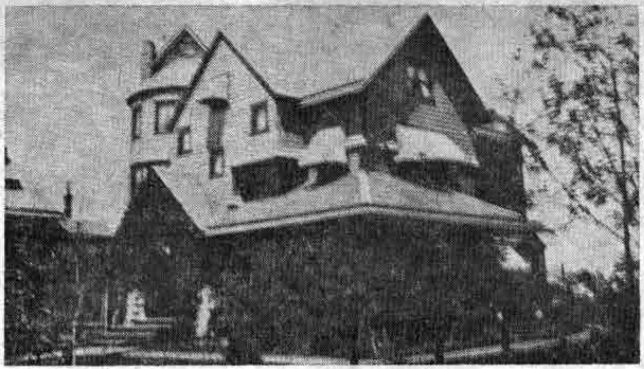 The second picture in today’s column shows the handsome Schultz home as it looked when first occupied by that family. The picture has been taken from the east side, showing both the front and side steps to the wide porch, which almost half encircled the house. One of the early illustrated booklets issued by Wendell and Treat, “Home Builders” for the Wayne Estate, states that while “arrangements can be made to build any kind of house you prefer… a selection of one of the following plans will be to the advantage of the buyer, in that we will share with you the profit of wholesale building.” Evidently a number of buyers took advantage of this “wholesale building”, which accounts for the duplication of plans in houses in Wayne and St. Davids. Other first floor rooms were a parlor, and, of course, a dining room of goodly proportions and a large kitchen with a laundry back of it. Like all the other Wayne Estate houses, the “Round End” ones had five bedrooms and a bathroom on the second floor and several other rooms on the third floor. This type is found pretty generally throughout North Wayne. Originally priced at $8,000, they were built on lots 120 x 225 feet, and were among the larger and more pretentious houses of that period in Wayne. Whether all of them had still a fourth floor space in the way of a small “look-out” on top of the “round end” is not known to this columnist. Certainly, this cupola effect shows very plainly in today’s illustration. The view from its windows must have embraced the whole countryside as well as all of the small, but rapidly growing settlements of Wayne and of St. Davids. Other Wayne Estate houses with distinctive names included the “Flemish House”, “Gabled Inn”, “New Tower House” and Pillar House”. The first Minute Book of the Wayne Needlework Guild, lent to your columnist by Miss Virginia D. Keeney, president for the past several years, contains brief and business-like records of the local group from its beginning in March, 1891, through to the April, 1913 meeting. This early book shows the seriousness of effort and the earnestness of purpose of the women who sought to establish a branch of a rapidly growing national organization in the small community of Wayne. Meetings of the executive group took place in the homes of various members of the group as well as in the old Wayne Coffee House, on Audubon avenue. Annual meetings were held in such places as the rooms of the North Wayne Protective Association, the Library, the Central Baptist Church and the Saturday Club. At the meeting of February 1, 1900, the suggestion was made from national headquarters that each branch hold a meeting preliminary to the annual meeting, the nature of which could be either social or business. The Wayne branch decided to give a tea at the Saturday Club the following September, and so successful was the affair that the executive committee decided to make it an annual event, to take place at a specified time before the annual meeting. The idea of having the two meetings coincide did not become effective until several years later, when the executive board realized the importance of having all members of the local Needlework Guild see the display of new garments collected for distribution. Now, the annual Ingathering, with its business meeting and its entertainment has become the highlight of the year for the Wayne Needlework Guild. Minutes of the first annual meeting, held on October 8, 1891, show that 236 garments had been collected by the directors, a very creditable showing for the seven months’ period since the Wayne Branch had been organized. The last entry in the old Minute Book shows that by October 24, 1912, this number had almost doubled, with a total of 1600 garments. The report given at the annual meeting in October, 1952, shows 5,343 garments, more than four and one-half times the contribution in 1891. The original number of 27 directors has now grown to 63, with five contributing groups; The Wayne Sewing Group, the Junior Saturday Club, Girl Scouts, Knitting Group and the Junior Service Board. The list of beneficiaries has grown from an original list of nine in 1891 to 37 in 1952. The Neighborhood League heads the list with a total of 975 gifts from the Wayne Needlework Guild. Another local beneficiary is the Royer-Greaves School, and there are nine hospitals on the list. Among others who have received help are the American Friends Service, Delaware County Children’s Aid Society, Home for Aged and Infirm Colored, Interdenominational Foreign Missionary Society, Pennsylvania Working Home for Blind Men, Presbyterian Children’s Village and the Salvation Army Day Nursery. 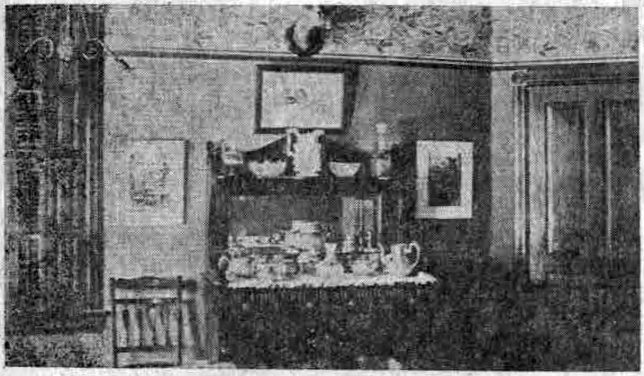 Miss Grace Roberts, whom your columnist interviewed recently on the part played by the Wayne Needlework Guild during World War I, recalls vividly the packing of good, used clothing that was done in the front hall of her home on Windermere Avenue. This was in 1914, before America had entered the conflict. Mrs. William A. Nicholson, of St. Davids, was then president of the Wayne Branch of the Needlework Guild and Miss Roberts was a member of her executive committee. Assisting Mrs. Nichols and Miss Roberts in the arduous job of packing barrels for shipment abroad were Mrs. Nichols’ son, Albert, and Miss Roberts’ neighbor, Mr. W.H. Badger and his daughter, Miss Dorothy Badger, now Mrs. W.H.H. White. (Note: Miss Miel was a well-known Wayne resident doing War Relief work in France.) During World War II the Needlework Guild and Red Cross cooperated in providing needed clothing for families of service men. Next Wednesday, October 21, the Annual Ingathering of the Wayne Needlework Guild will be held in St. Mary’s Parish House under the leadership of Miss Keeney. With well over 5000 garments received as donations at this time last year, the officers and directors are anticipating gifts of 6000 or more this Wednesday. On Wednesday, October 21, the Annual Ingathering of the Wayne Branch of the Needlework Guild will be held in the Parish House of St. Mary’s Church on Lancaster Pike and Louella avenue. This pleasant occasion will mark the 63rd annual meeting of Wayne’s needlework Guild, one of the oldest groups of that great national organization aptly described as the “charity that helps other charities”. The first small beginnings of the Needlework Guild were not in this country. They go back to a day in Wales in the early 1880’s when a mine disaster left scores of children homeless. A generous hearted English woman, Lady Wolverton, solicited the aid of her friends in founding an orphanage at Iwerne, Dorchestershire, England, where these children could be fed and sheltered. With the completion of this building in 1882 there came the problems of clothing, bedding and other articles essential to even the meager existence they would have there. Once again Lady Wolverton turned to her friends for aid with this plea, “Help to make and care for the children’s wardrobe by giving two new garments”. It is said that these friends knitted and sewed until the children were completely outfitted. Lady Wolverton’s little group of sewers and knitters, whom she had named “The Needlework Guild”, attracted attention not only among the townspeople, but throughout all England as well. Finally, under royal auspices, the London Needlework Guild was formed. And then an American woman, Mrs. Alanson Hartpeuce, as she traveled through England, became so impressed by the work of this group that she brought back to America word of its activities. In consequence her niece, Miss Laura Safford (later Mrs. John Wood Stewart) with the help of her friends formed “The Needlework Guild of Philadelphia”, the forerunner of the present national organization. This Philadelphia group aimed to have each one of its members contribute annually two or more new articles of wearing apparel or household linen. The principle of contributing “new” articles was important since the pride of possession of a new garment served to boost the morale of the needy recipients. By 1891 the charitable work of the Needlework Guild of Philadelphia had spread to such an extent that its leaders decided to change its name to the more comprehensive one of “The Needlework Guild of America”. Five years later this non-sectarian organization was formally incorporated “for the purpose of collecting new garments and distributing them to hospitals, homes and other charities and of forming and governing branches of the said Guild organized for similar work”. By the turn of the century many new branches were being formed in towns and cities throughout the United States. To meet the financial problems of this expansion, membership was now granted to those who wished to contribute towards the extension and maintenance of the work. Thus many men became supporters of the Needlework Guild. By 1907 the Guild had become affiliated with the American Red Cross in order to cooperate with the latter “in times of international, national and local disaster”. In 1909 it also became affiliated with the General Federation of Women’s Clubs and in 1906 had become a member of the National Conference of Social Work. Its activities were far from routine, as witnessed by the part it played in relief work during the Johnstown and Dayton floods, the San Francisco earthquake and fire and many other lesser known local disasters. At the outbreak of World War I workrooms were set up in Lyons, France, to help those left homeless, while in New York the War Relief Department was established, continuing to render assistance to the Allied countries as late as 1931. During World War II the most important work of the Needlework Guild was to provide clothing for the families of American servicemen. This was a gigantic project which required the combined efforts of all the branches of the Needlework Guild. Wayne’s part in the work of this organization dates back more than 62 years, for it was at a meeting in the room of the Wayne Library on March 19, 1891, that the local branch was formed. On this occasion Mrs. Thomas H. Morrison, president of the Parent Guild, was present and explained the object of the work, after which the meeting was organized. The first president was Mrs. Arthur W. Howell, who served in that capacity for several years. The first vice-presidents were four in number, namely Mrs. Edward Pugh, Mrs. Henry Pleasants, Mrs Joseph W. Paul and Miss Anna C. Matlack. Miss Agnes Ellis Boyd became the first secretary of the Wayne organization. The list of the first directors is made up of names of women well known for their interest in community and church work in Wayne in the 1890’s. They were Mrs. Samuel A. Abbott, Mrs. A.M. Ware, Mrs. John Miller, Mrs. I.K. 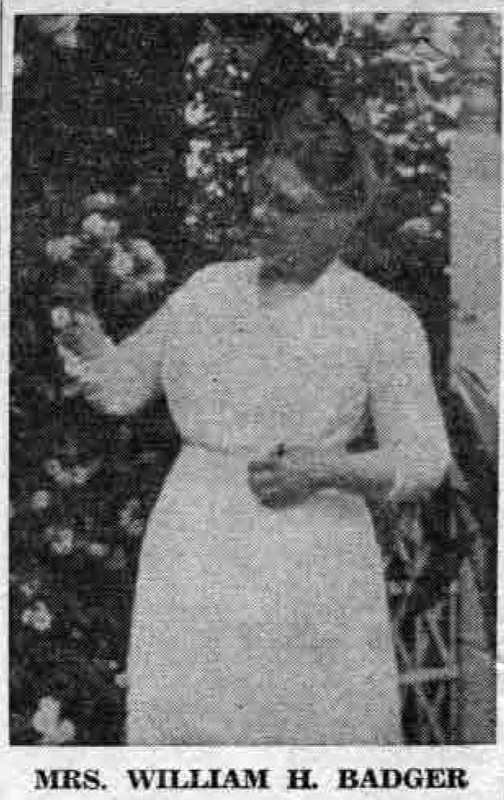 Conrad, Mrs. R.C. Peterson, Mrs. F.W. Farrell, Mrs. George M. Wells, Mrs. George W. Chapin, Mrs. George R. Stoeker, Mrs. A.J. Wiltburger, Mrs. W.A. Wiltburger, Mrs. H.D. Hughes, Mrs. Alfred Wetherall, Mrs. J.L. Wentworth, Mrs. Louis Johnson, Mrs. Joseph Shock, Mrs. J.P.P. 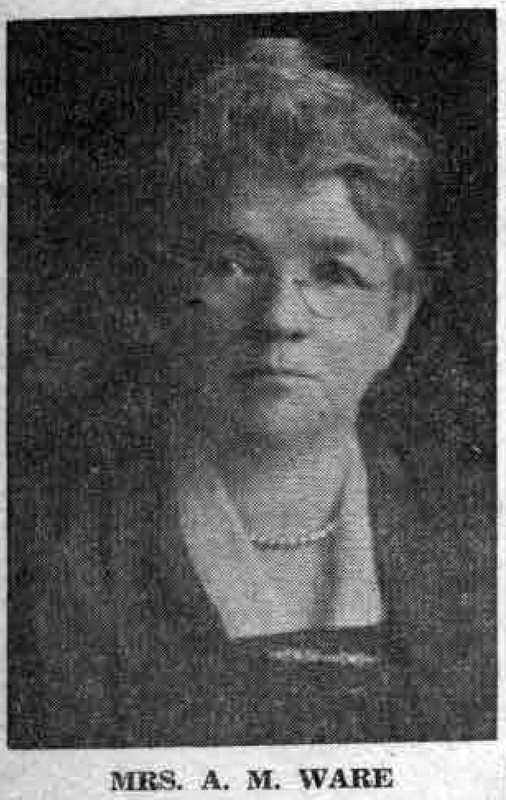 Brown, Mrs. R.B. Okie, Mrs. W. Livingston Boyd, Mrs. John Adler, Mrs. Henry Pleasants, Mrs. William Goodrich, Mrs. William Stroud, Mrs. Frank Smith and Miss C. Pleasants. Then, as now, each of these directors was responsible for the collection of new garments for the annual meeting to be held in October of that year. By the time this meeting took place the names of two other well known Wayne women had been added to the list of directors, Mrs. W.H. Badger and Mrs. Richard Johnson. More than 800 garments had been collected by these directors. Among the institutions to which they were sent were the Bethany Home, the Maternity Home, the Children’s Aid Society, the Western Temporary Home and the Consumption Home for Women, all Philadelphia institutions. One closer to home was the Hospital of the Good Shepherd in Rosemont. In addition there were several recipients in other parts of the state. Shown in this week’s column are the pictures of Mrs. 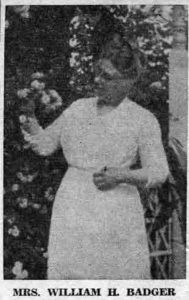 A.M. Ware, one of the founders of the Wayne Needlework Guild and Mrs. W.H. Badger, who joined the guild shortly afterwards. During the past week there has come into the temporary possession of your columnist a book of priceless old pictures of Wayne of the 1900’s, lent to her by George W. Schultz. Mr. Schultz first came to Wayne in 1888, when his father and mother, Mr. & Mrs. G.H. Schultz, with their four children, settled in the 200 block on Walnut avenue, in one of the first houses built by the Wayne Estate. Now Mr Schultz is again making his home in Wayne, after an absence of some years. The pictures show a number of Wayne’s landmarks in the way of the early homes, buildings and outdoor scenes and are beautiful examples of photography. All were taken by Mr. Schultz, who has preserved them so carefully that they are clear in every detail. From time to time various of these pictures will be reproduced in this column. The first of the two pictures this week is an interior view of the Merrivale Club and the second is one of Kelly’s Dam, with the John P. Wood house on the corner of Walnut avenue and Radnor road shown in the distant background. In the spring of 1949, when this column was just getting under way, descriptions of the clubs and the dam were presented, based on articles written by Mr. Schultz. It is interesting now to turn back to these early columns for a brief resume of the stories of both the club and of the dam. The Merrivale Club played an important part in the annals of Wayne’s early sports and recreation. The first clubhouse was a frame building situated near the railroad in North Wayne. 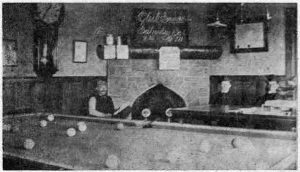 In its early days it had a baseball diamond and two tennis courts outside, with rooms for billiards and bowling inside. Among the members were Robert Hare Powel, Jack Claghorn, Morris Wetherill, Frank Howley and George and William Schultz. Some of the Merrivale Club members also formed a group called “The Walkers”, who took early Sunday Morning hikes. In addition to those already named, the group had among its members David Knickerbocker Boyd, later a well known architect; Billy Brown, son of the publisher of the “Wayne Times”; Charles Gleason, Lee Harrison and Bill Everly. After this first clubhouse was destroyed by fire, activities were resumed in a building on the Francis Fenimore property in St. Davids. This was called the Radnor Cricket Club, since interest in the game of cricket had by this time succeeded that in other and older sports. By this time Philadelphia was the center of this new English game in the United States, and for several years matches were played at the Radnor Cricket Club with other teams in the Philadelphia area. Tom Credican was the professional for the local team, which was so good that one season they won all matches except that against the Merion Cricket Club. After a time, interest in the English game waned, and local activities ceased after this clubhouse also burned to the ground. Golf superseded cricket, and the St. Davids Golf Club, one of the oldest institutions of its kind in the United States, was formed. Meanwhile two other sports had been flourishing – bicycling and swimming. The bicycle craze struck Wayne in the late 90’s, and a bicycle club was formed on the pike in South Wayne. Karl, the German steward, provided excellent meals for club members and their guests, before many a long bicycle jaunt. 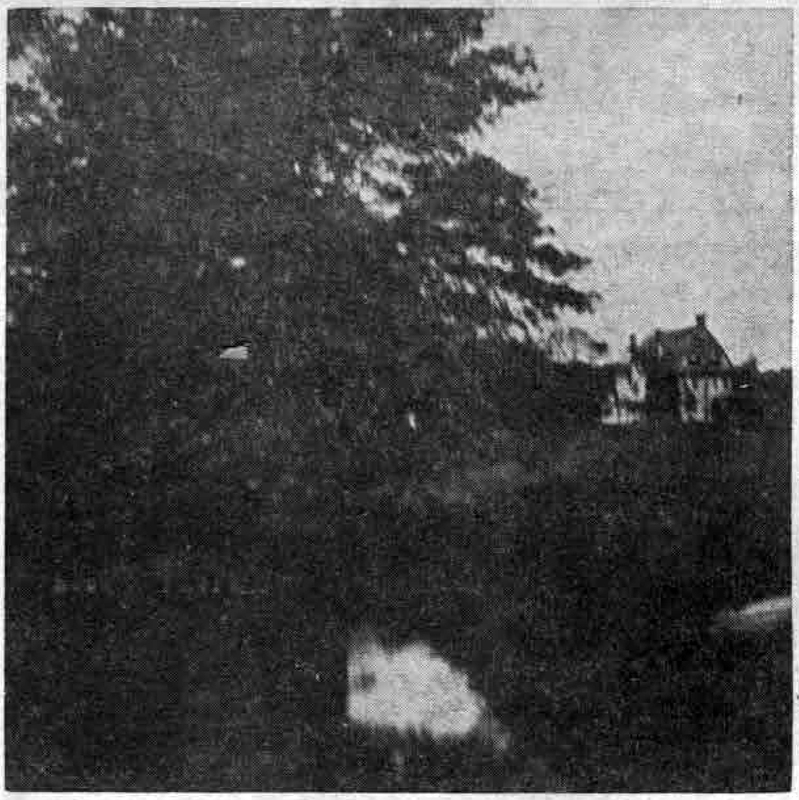 The picture of Kelly’s Dam shown in this column was taken in its early days, when it was merely a body of water down in a hollow in the general vicinity of what is now Willow avenue. Later, an interested group rented the rights to the dam and began to make some improvements. A dressing room was built on piles and equipment included diving boards and a slide. It was enclosed by a high wooden fence with a boardwalk along one side, and there was a filtering system to keep the water clean. In winter, when the pool froze over, there was skating by lantern light, with a stove for heat in the small clubhouse. Summer activities were under the supervision of Kistler, then swimming coach, who later became an instructor at the University of Pennsylvania. From time to time swimming meets were held that were quite large, considering the size of Wayne. In the light of present day methods of teaching swimming, those of an earlier period are interesting by way of contrast. A telegraph pole was sunk in the ground at each end of the pool, with a heavy wire cable stretched between. To this was added a rope on a pulley wire with a belt attached at the water line. The candidate for swimming lessons was strapped into the belt and thus taught the art without danger of going down. Among the early members of the swimming club were the Wendells, the Heilners, the Spiers, the Conkles, the Hallowells, the Fulweilers, the Reginald Harts, the Canizares, Frederick Jones, Louis Erben, Charlie Maguire, the large John P. Wood family, and many others. In time Fenimore’s Pond in St. Davids replaced Kelly’s Dam in popularity. “Billy Pump”, so named because he ran the pumping station for the Pennsylvania Railroad, was in charge here. Though he could not swim a stroke himself, Billy patrolled the pond in his rowboat so conscientiously that he never had a drowning. Both Kelly’s Dam and Fenimore’s Pond were the scenes of numerous baptisms. Indeed, it is said that the crowd at the former place on one occasion was so great that the boardwalk gave way and some of the spectators were tumbled into the water. So much for early day sports in Wayne as brought to mind by these pictures of the Merrivale Club and of Kelly’s Dam.